Previous post: Need Help with Smokey Eyes? Next post: Who’d You Rather? It is getting waaaaaay more intense! Yesterday was definitely intense. It was mostly in the morning that I was dying! I don’t think I had enough to eat for breakfast. But I solved that problem today. I had enough to fill me up until after lunchtime. That helped my mood a great deal. After only a few days, I feel so much better already! I don’t feel as lethargic or heavy and my body just feels “clean”. I’m so happy I decided to do this cleanse. But it is only day 4 and I don’t want to jinx anything. Everything I have eaten so far has been pretty healthy. 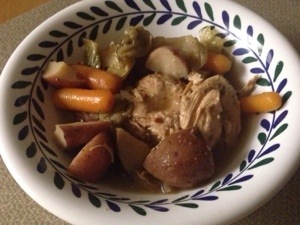 Like I mentioned on day 2, I made a chicken stew in the crockpot that is to die for!! (picture below). I’m proud of myself for sticking to a pretty organic diet. No cookies, no cakes, no ice cream. NO SUGAR AT ALL! Fruit and granola has been a life saver as a snack or when I get a sweet tooth. As well as celery to eat on the go. I’m trying to make this clean eating stick because it really IS a lifestyle. It’s okay to indulge here and there, but it’s best to have control. I am slowly but surely learning that! For anyone that is battling with whether or not to start a cleanse….DO IT!